The LEGOLAND® Malaysia Resort brings together a LEGOLAND Park, Water Park and Hotel in one LEGO® themed location. It is a family holiday destination with more than 70 hands-on rides, slides, shows and attractions. It has seven themed areas of attractions for all ages such as The Beginning, LEGO® Technic, LEGO Kingdoms, Imagination, LEGO City, Land of Adventure and MINILAND. It’s an inspirational land where the children are the heroes. From LEGO experiment centres to rollercoasters, the park is a day-long voyage of discovery for all the family. LEGOLAND Water Park which can be enjoyed seperately or in combination with the theme park has more than 20 slides and water based attractions and boasts 70 LEGO models. The LEGOLAND Malaysia Resort is designed for families with children aged 2-12. This role is responsible for delivering all facets of recruiting success throughout the organization. This will be achieved through the development of local and national recruiting plans, employing traditional sourcing strategies and resources as well as developing new, creative recruiting ideas. You will play a critical role in ensuring we are hiring the best possible talent. You will have the opportunity to be exposed to other HR functional areas assigned: Departmental development, Human Resources Management System (HRMS), HR Operations and Administration. Candidate must possess at least a Bachelor's Degree, Post Graduate Diploma, Professional Degree, any field. Detail oriented & strong follow through. We encourage only incumbents with the related qualification/experience to apply. We offer global/international experience and learning exposure with ample career development opportunities. Also, we make it FUN - It's what we do best! 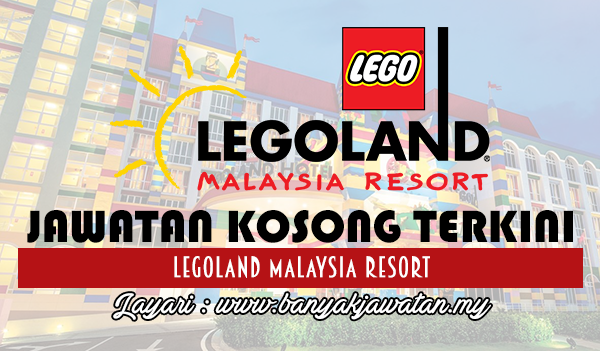 0 Response to "Jawatan Kosong di Legoland Malaysia Resort - 16 Ogos 2018"